P = .48 for the nonreoperative vs reoperative groups. California Cancer Registry. Welcome to California Cancer Registry (CCR). http://www.ccrcal.org/index.shtml. Accessed September 6, 2016. OSHPD. Office of Statewide Health Planning and Development. http://www.oshpd.ca.gov/. Accessed September 6, 2016. Cohen J. Statistical Power Analysis for the Behavioral Sciences. Hillsdale, NJ: Lawrence Erlbaum Associates Inc; 1988. National Institutes of Health. National Cancer Institute SEER Training Modules. https://training.seer.cancer.gov/. Accessed August 19, 2016. Question What is the association of initial neck dissection with the need for reoperation in medullary thyroid carcinoma? Findings We performed a population-based study of 953 patients with medullary thyroid carcinoma (1999-2012) using California statewide hospital data; 99 patients underwent reoperation. Central and lateral lymph node dissection performed at the initial operation was significantly associated with decreased recurrence leading to reoperation; only 216 of 609 patients underwent central neck dissection at the initial operation. Meaning Initial neck dissection in medullary thyroid carcinoma may decrease local recurrences; central neck dissection continues to be underused. Importance The association of initial neck dissection with recurrence in medullary thyroid carcinoma (MTC) has not been evaluated on a population level to date. Objective To elucidate risk factors associated with reoperation in MTC and disease-specific mortality. Design, Setting, and Participants A retrospective analysis was performed of hospital data obtained from the California Cancer Registry and the Office of Statewide Health Planning and Development from January 1, 1999, through December 31, 2012. The dates of the analysis were January 1, 1999, to December 31, 2012. A population-based sample of 953 patients with MTC was identified. Patients who underwent thyroid surgery and had a minimum postoperative follow-up of 2 years (n = 609) were included in the analysis. Exposure Initial neck dissection in MTC. Main Outcomes and Measures Recurrent MTC leading to reoperation and disease-specific mortality. Results Of the 609 patients with MTC who underwent thyroid surgery, the mean (SD) patient age at diagnosis was 52.6 (17.5) years, and 60.8% (n = 370) of the patients were female. The mean (SD) tumor size was 2.8 (2.0) cm. Although initial central neck dissection is recommended by published MTC guidelines, only 35.5% (216 of 609) of patients underwent central neck dissection at the time of the initial thyroidectomy. The rate of reoperation was 16.3% (99 of 609), and the median time to reoperation was 6.4 months. The presence of lymph node metastasis increased the risk of reoperation (hazard ratio [HR], 3.43; 95% CI, 2.00-5.90), while central and lateral neck dissection performed at the initial operation was protective (HR, 0.53; 95% CI, 0.30-0.93). In patients who underwent reoperation, 45.5% (45 of 99) were disease free at a median follow-up of 7.7 years. Five-year disease-specific mortality for the entire cohort was 13.5% (82 of 609). Independent risk factors for disease-specific mortality included older age (HR, 1.36 per decade; 95% CI, 1.17-1.59), tumor size greater than 2 cm (HR, 2.83; 95% CI, 1.08-7.44 for >2 to 4 cm and HR, 2.89; 95% CI, 1.09-7.71 for >4 cm), and regional (HR, 4.77; 95% CI, 2.29-9.94) and metastatic (HR, 21.08; 95% CI, 9.90-44.89) disease. Reoperation was not associated with increased mortality. Conclusions and Relevance Lymph node dissection may decrease recurrence leading to reoperation for patients with MTC. Reoperation is a viable strategy to achieve long-term disease-free survival in appropriately selected patients. Central neck dissection remains underused. Prophylactic central neck dissection for patients with clinically node-negative disease has been standard in MTC for decades, and current guidelines from the American Thyroid Association (ATA) also recommend total thyroidectomy and central neck dissection for patients with MTC.2,5,6 Lateral neck dissection is generally limited to patients with clinically positive lymph nodes, but prophylactic ipsilateral lateral neck dissection may be considered when the preoperative calcitonin level exceeds 20 pg/mL2 (to convert calcitonin level to picomoles per liter, multiply by 0.292). Despite a presumed curative resection, more than 50% of patients do not achieve biochemical cure as evidenced by persistent calcitonin elevation, and 10% to 25% of patients with MTC develop recurrent structural disease.3,7-9 To avoid the morbidity associated with reoperative neck surgery, ATA guidelines2 recommend appropriate compartment-oriented lymph node dissection during the initial thyroidectomy, although these guidelines are based on limited evidence. Existing population-level studies10,11 of MTC have not captured disease recurrence and reoperation because this information is not available in the Surveillance, Epidemiology, and End Results (SEER) database or the National Cancer Database. In the present study, we analyzed data from the California Cancer Registry (CCR) linked to the Office of Statewide Health Planning and Development (OSHPD) to allow for longitudinal follow-up. The aim of this study was to evaluate the overall trend in surgical management of MTC as it relates to ATA guidelines2 and to identify risk factors for persistent or recurrent disease leading to reoperation and disease-specific mortality. We hypothesized that the performance of initial neck dissection would be associated with a decreased risk of reoperation in MTC. The data source for this study was a linked CCR-OSHPD data set12,13 from January 1, 1999, through December 31, 2012. The dates of the analysis were January 1, 1999, to December 31, 2012. The CCR is a statewide cancer surveillance system that collects information on all cancers diagnosed in California and can be linked to data from California’s OSHPD using individual patient identifiers. The OSHPD collects data on inpatient and ambulatory surgery encounters from all licensed hospitals and ambulatory surgery clinics in California. Linkage of the OSHPD data with the CCR allows for longitudinal follow-up of individual patients and detection of multiple operations for the same patient over time. This study was approved by the University of California, Los Angeles institutional review board. A waiver of informed consent was obtained from the institutional review board due to the use of publically available deidentified data. The following Current Procedural Terminology (CPT) and International Classification of Diseases, Ninth Revision (ICD-9) procedure codes were used to identify patients who underwent surgical treatment: thyroid lobectomy (CPT codes 60200, 60120, 60212, 60220, and 60225 and ICD-9 codes 066, 067, 0612, 062, 0631, and 0639), total thyroidectomy (CPT codes 064, 0650, 0651, and 0652), total thyroidectomy with central neck dissection (CPT code 60252), total thyroidectomy with lateral neck dissection (CPT code 60254), central neck dissection (CPT code 21557 and ICD-9 code 403), and lateral neck dissection (CPT codes 38720 and 38724 and ICD-9 codes 403, 404, 4040, 4041, and 4042). Patients undergoing lateral neck dissection were assumed to have also undergone a central neck dissection. Reoperation was defined as any of the above operations performed more than 30 days after the index operation. In patients who underwent lobectomy followed by completion thyroidectomy, the latter was considered to be the index operation and was not recorded as a reoperation. Analysis of reoperation was restricted to cases diagnosed from 1999 through 2010 to allow for a minimum postoperative follow-up of 2 years. Tumor status and vital status in combination with cause-of-death variables were used to determine disease-specific mortality. Summary statistics were used to describe baseline characteristics. Standardized differences were used to represent differences in effect sizes between groups.16 Standardized differences of 0.2, 0.5, and 0.8 represent small, medium, and large effect sizes, respectively.17 Survival was analyzed using the Kaplan-Meier method, and the log-rank test was used to determine differences in survival that were statistically significant. Cox proportional hazards regression models were used to identify factors independently associated with disease-specific mortality and reoperation. Multivariable regression was performed using backward elimination, with retention of covariates with P < .20. All tests were 2 sided, and P < .05 was considered statistically significant. Statistical analysis was performed with a software program (SAS, version 9.4; SAS Institute Inc). Over the past decade in California (1999 through 2012), 953 patients were diagnosed as having MTC. Of these patients, 729 underwent surgical treatment, and 609 had a minimum postoperative follow-up of 2 years. The mean (SD) patient age at diagnosis was 52.6 (17.5) years, and 60.8% (n = 370) of the patients were female (Table 1). The mean (SD) tumor size was 2.8 (2.0) cm, and extrathyroidal extension was present in 18.7% (n = 114) of cases (Table 2). The rate of lymph node metastasis was 43.5% (n = 265), with 58.5% (155 of 265) of nodal metastases located in the central neck and 35.8% (95 of 265) located in the lateral neck. Most patients were initially seen with localized (53.3% [321 of 602]) or regional (35.4% [213 of 602]) disease. The rate of distant metastatic disease was 11.3% (68 of 602). The initial surgical procedure was thyroid lobectomy in 7.6% (46 of 609) of patients. An additional 15.1% (92 of 609) of patients underwent completion thyroidectomy after a median of 70 days after initial lobectomy. The remaining patients underwent subtotal or total thyroidectomy alone (36.3% [221 of 609]) or in conjunction with central (35.5% [216 of 609]) or central and lateral (25.5% [155 of 609]) lymph node dissection. Patients treated at hospitals in the highest-volume quintile more frequently underwent initial central neck dissection (51.7% [46 of 89] vs 30.4% [122 of 401], P < .01) and less frequently underwent initial lobectomy (9.0% [8 of 89] vs 26.2% [105 of 401], P < .01) compared with patients in the lower 4 quintiles. Adjuvant external beam radiotherapy was used for 12.3% (75 of 609) of patients. The rate of reoperation was 16.3% (n = 99). The median follow-up periods for the reoperative and nonreoperative groups were 7.7 years and 5.7 years, respectively. The median time to reoperation was 6.4 months. In patients who underwent reoperation, 45.5% (45 of 99) were disease free at a median follow-up of 7.7 years. In contrast, 69.4% (354 of 510) of patients who did not undergo reoperation were disease free at a median follow-up of 5.7 years. Patients who underwent reoperation were younger at diagnosis (mean age, 47.9 vs 53.5 years, with a standardized difference of −0.33) and more frequently had lymph node metastasis identified at the initial surgery compared with those who did not have a reoperation. In the reoperative group compared with the nonreoperative group, tumors were also more frequently greater than 2 cm (49.5% [45 of 91] vs 35.8% [172 of 481] for >2 to 4 cm and 26.4% [24 of 91] vs 19.8% [95 of 481] for >4 cm, with a standardized difference of 0.44) and had extrathyroidal extension (32.3% [32 of 99] vs 16.1% [82 of 510], with a standardized difference of 0.41) (Table 2). The extent of initial surgery was similar in the reoperative vs nonreoperative groups: subtotal or total thyroidectomy was performed in 39.4% (39 of 99) vs 35.7% (182 of 510), subtotal or total thyroidectomy with central neck dissection was performed in 39.4% (39 of 99) vs 34.7% (177 of 510), and subtotal or total thyroidectomy with central and lateral neck dissection was performed in 29.3% (29 of 99) vs 24.7% (126 of 510). Of 46 patients who underwent a thyroid lobectomy not followed by a completion thyroidectomy, only 1 patient (2.2%) underwent reoperation during the study period. On multivariable analysis, the presence of lymph node metastasis increased the risk of reoperation (hazard ratio [HR], 3.43; 95% CI, 2.00-5.90), while central and lateral neck dissection performed at the initial operation (HR, 0.53; 95% CI, 0.30-0.93) was protective (Table 3). The risk of reoperation minimally increased with the number of lymph nodes examined (HR, 1.01 per node; 95% CI, 1.00-1.02). Central neck dissection alone was not associated with a decreased risk of reoperation for the entire cohort. In a subset analysis of patients with regional disease, there was a nonsignificant association with a decreased risk of reoperation in patients who underwent central neck dissection alone (HR, 0.82; 95%, 0.31-2.18) or central and lateral neck dissection (HR, 0.58; 95% CI, 0.29-1.14). Five-year disease-specific mortality for the entire cohort was 13.5% (82 of 609) and varied significantly by stage, with 5-year mortality of 2.2% (95% CI, 1.2%-4.2%) for localized disease, 9.8% (95% CI, 3.7%-14.3%) for regional disease, and 58.3% (95% CI, 49.2%-67.7%) for distant metastatic disease. No significant difference in 5-year disease-specific mortality was observed in the nonreoperative (11.8%; 95% CI, 9.2%-15.1%) vs reoperative (8.9%; 95% CI, 4.5%-17.0%) groups (P = .48) (Figure). On multivariable analysis, reoperation was not found to be a risk factor for disease-specific mortality. Independent risk factors for disease-specific mortality included older age (HR, 1.36 per decade; 95% CI, 1.17-1.59), tumor size greater than 2 cm (HR, 2.83; 95% CI, 1.08-7.44 for >2 to 4 cm and HR, 2.89; 95% CI, 1.09-7.71 for >4 cm), and the administration of external beam radiotherapy (HR, 2.14; 95% CI, 1.23-3.71). Disease stage was the strongest risk factor for mortality for both regional (HR, 4.77; 95% CI, 2.29-9.94) and metastatic (HR, 21.08; 95% CI, 9.90-44.89) disease (Table 4). To our knowledge, this investigation is the first population-level study to analyze risk factors for persistent or recurrent disease leading to reoperation in MTC. The rate of reoperation in our cohort of patients who underwent surgery for MTC in California was 16.3% (99 of 609). The performance of central and lateral neck dissection was associated with a decreased risk of reoperation, particularly for patients who were initially seen with regional disease. Despite published MTC guidelines,2 only 35.5% (216 of 609) of patients underwent central neck dissection at the time of initial thyroidectomy. Recurrence in MTC is common and likely reflects disease burden, biology at presentation, and completeness of initial surgery. Up to 50% of patients with MTC do not achieve long-term biochemical cure.18 In a case series of 94 patients with MTC from the Royal North Shore Hospital in Sydney, Australia, rates of localized and distant recurrence at a median follow-up of 7.5 years were 22% and 16%, respectively.8 Additional reports of structural recurrence rates in MTC range from 10% to 27%.3,7-9 The reoperation rate observed in our study was 16.3% (99 of 609), which is consistent with structural recurrence rates reported in the literature. In a study19 of 86 patients with MTC from 2 tertiary referral centers in the Netherlands, 37% required reoperation. However, the inclusion criteria for that study were a palpable tumor or suspicious lymphadenopathy at presentation, causing a selection bias toward more advanced cases. Our study of a statewide cancer registry reflects patients with MTC treated in centers throughout California and is less subject to the selection bias observed in tertiary referral centers. Prophylactic central neck dissection has been part of the standard treatment of MTC for decades6 based on the high frequency of lymph node metastasis20 and increased cure rates after compartment-oriented neck dissection.3,18,19 This recommendation is reflected in current ATA guidelines.2 However, adherence to these practice standards is poor. In an analysis of the SEER database from 1973 to 2006, Panigrahi et al21 reported that only 59% of patients with MTC received surgery in concordance with ATA guidelines. In our study of patients diagnosed as having MTC from 1999 through 2012, only 35.5% (216 of 609) of patients underwent initial central neck dissection, which indicates that a significant number of patients with MTC continue to receive surgery discordant with published recommendations. While 35.5% is significantly lower than the 59% reported previously, this result is likely because cancer registries, such as the SEER database, summarize staging data from the total extent of surgery during the first course of treatment, even if performed over multiple operations.22 In contrast, the OSHPD identifies each unique operation, suggesting that rates of initial central neck dissection are likely lower than previously reported in the SEER database. The high rate of initial lobectomy (22.7% [138 of 609]) and the low rate of central neck dissection (35.5% [216 of 609]) observed in our study may be due to some centers’ lack of experience with an uncommon cancer. 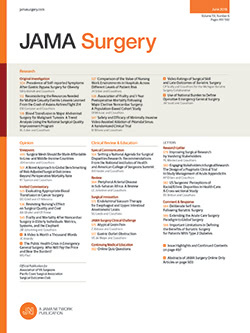 Surgeon volume has been shown to be associated with outcomes such as complications and costs.23 Our data suggest that this relationship may extend to improved preoperative diagnosis and surgical decision making for MTC because patients treated in the highest-volume hospitals more frequently underwent an appropriate initial extent of surgery. The significantly lower rate of initial lobectomy at the highest-volume hospitals implies that more patients may have been correctly diagnosed as having MTC from the fine-needle aspiration biopsy specimens. Because the proper evaluation and treatment of thyroid cancer is a multidisciplinary effort involving endocrinologists, radiologists, cytopathologists, and surgeons, our study highlights that treatment at centers with experienced clinicians may be associated with appropriate initial surgery. While institutional series18-20 have shown decreased rates of persistent or recurrent disease after total thyroidectomy with compartment-oriented lymph node dissection, population-level data are lacking. Although baseline rates of reoperation herein were not significantly lower in patients who underwent an initial neck dissection, this finding is likely due to a selection bias because patients in the reoperative group had more advanced disease and more frequently had extensive operations. After adjustment for multiple factors, including disease stage, we found that central and lateral neck dissection performed at the initial surgery were associated with a decreased risk of reoperation, while lymph node metastasis significantly increased the risk of reoperation. This result supports the recommendation for routine central neck dissection in MTC and the consideration of lateral neck dissection in high-risk patients (eg, those with elevated calcitonin levels).2 Of note, our low median time to reoperation of 6.4 months suggests that a significant number of reoperations were likely performed for persistent rather than recurrent disease. Central neck dissection alone was not found to decrease the risk of reoperation for the entire cohort. However, this finding may be due to less clear coding designations for central neck dissection compared with lateral neck dissection in the CCR database. In addition, the influence of central neck dissection may differ depending on disease stage. Patients with distant disease are less likely to be reoperative candidates, and patients with initial localized disease who have no lymph node metastases may be less likely to benefit from neck dissection. Lymph node dissection may have the greatest influence in decreasing recurrence for patients with regional disease, which includes tumors associated with extrathyroidal extension or lymph node metastasis. The ATA guidelines also recommend that if MTC is discovered after a thyroid lobectomy, then completion thyroidectomy is only indicated in high-risk cases, such as patients with RET mutation, elevated postoperative calcitonin levels, or structural disease on imaging.2 In a multicenter study24 of 313 patients with sporadic MTC, the prevalence of bilateral MTC was 5.6%. In our study, although a minority of patients underwent lobectomy alone at the initial operation, only a single patient underwent reoperation, supporting the contention that completion thyroidectomy and neck dissection may not be necessary in carefully selected patients. Biochemical cure in MTC may be challenging to achieve in the setting of lymph node metastases. However, reoperation has been shown to be a viable treatment strategy in selected patients with recurrent MTC, resulting in biochemical cure in up to one-third of patients.7,25 Cure after reoperation is more likely if the calcitonin level is 1000 pg/mL or less and 5 or fewer lymph nodes were removed at the index operation.26 Although we are unable to distinguish between biochemical and structural recurrence due to limitations of cancer registry data, 45.5% (45 of 99) of patients who underwent reoperation in our study were classified as disease free at a median follow-up of 7.7 years. Furthermore, reoperation was not found to be a significant risk factor for mortality. This result may be due to a positive effect of reoperation counteracting aggressive disease. Alternatively, 7.7 years may not have been sufficient to detect a difference in mortality rates in MTC, or nodal dissection may have had no positive influence on survival. Nevertheless, our data show that patients with recurrent MTC who undergo reoperation do not have poorer survival compared with those who do not. Therefore, reoperation for patients with MTC is appropriate in selected patients and can achieve durable long-term disease-free survival. Our study has several limitations inherent to registry data. There are limited procedure codes available to specify central neck dissection, and these codes may be underused. Therefore, while our rate of neck dissection is consistent with previous population-based studies,10 it may underestimate the true frequency of lymph node dissection. Furthermore, codes for central neck dissection may also designate patients who received selective nodal sampling as opposed to a true compartment-oriented dissection, decreasing our ability to identify an influence of central neck dissection on reoperation. There are also limited data on variables such as location (central vs lateral) and size of lymph node metastasis. Results of fine-needle aspiration biopsy specimens were not captured herein, and the extent to which inadequate surgery was due to lack of preoperative diagnosis is unclear. Furthermore, the CCR and the OSHPD do not capture data on a number of variables relevant to recurrence in MTC, such as the presence of sporadic vs hereditary disease. Finally, biochemical markers of disease for MTC (calcitonin and carcinoembryonic antigen levels) were not available, which precluded an analysis of biochemical cure. To our knowledge, this investigation is the first study to examine reoperation for patients with MTC on a population level. Lymph node metastasis was associated with an increased risk of reoperation. Central and lateral dissection performed at the index operation may decrease the need for reoperation. Although central neck dissection alone was not associated with a decreased risk of reoperation, limitations in coding may have decreased our ability to detect an association. Compartment-oriented lymph node dissection (in the central or lateral neck depending on initial extent of disease) remains underused but is recommended in accord with ATA guidelines2 to minimize the risk of recurrence. Accepted for Publication: May 20, 2017. Corresponding Author: Masha J. Livhits, MD, Section of Endocrine Surgery, Division of General Surgery, Department of Surgery, UCLA David Geffen School of Medicine, University of California, Los Angeles, 10833 Le Conte Ave, 72-228 Center for Health Sciences, Los Angeles, CA 90095 (mlivhits@mednet.ucla.edu). Author Contributions: Drs Kuo and Livhits had full access to all of the data in the study and take responsibility for the integrity of the data and the accuracy of the data analysis. Study concept and design: Kuo, Sho, Yeh, Livhits. Acquisition, analysis, or interpretation of data: Kuo, Sho, Li, Zanocco, Livhits. Drafting of the manuscript: Kuo, Sho, Li, Livhits. Critical revision of the manuscript for important intellectual content: Kuo, Sho, Zanocco, Yeh, Livhits. Statistical analysis: Kuo, Sho, Li, Livhits. Administrative, technical, or material support: Yeh, Livhits. Funding/Support: This study was supported in part by the H & H Lee Research Program (Dr Kuo).